Would you like to become fabulously wealthy just by using toothpaste correctly? If you’re like most people, you answered yes. Now, would you like to know the secret behind wealth by toothpaste? You know you would. Finally, would you like to get the secret at no extra cost to you? Friends, your answer to this last question disappoints me. You want me to reveal my secret for nothing. How do you expect me to become fabulously wealthy if I give this secret away? But don’t worry about me, friends. I’ve grown use to the taste of dry oatmeal three meals a day. So today, you are the lucky beneficiary of my largesse. Hold onto your dentures because I am going reveal the fluoride way to lots of money. With pictures! First, I can’t emphasize enough the need to squeeze that tube of toothpaste. Never squeeze in the middle of the tube. From day one, you must apply pressure from the bottom of the tube, gripping each side with thumbs and forefingers, pushing upward. Done properly, your tube will look like the one below. Some people are easily fooled into thinking it's empty. Sadly, many people see a tube like that and think all of the toothpaste is gone! I know better, and soon you will, too. How, you ask. Well, the answer is probably lurking in your junk drawer: a simple pair of scissors. Why don’t more people think of this? I believe it’s because “scissors” is a defective noun (Latin, plurale tantum), one of those words that has only a plural form. It’s one thing to find a scissor in your junk drawer; it’s another thing altogether to find a pair. 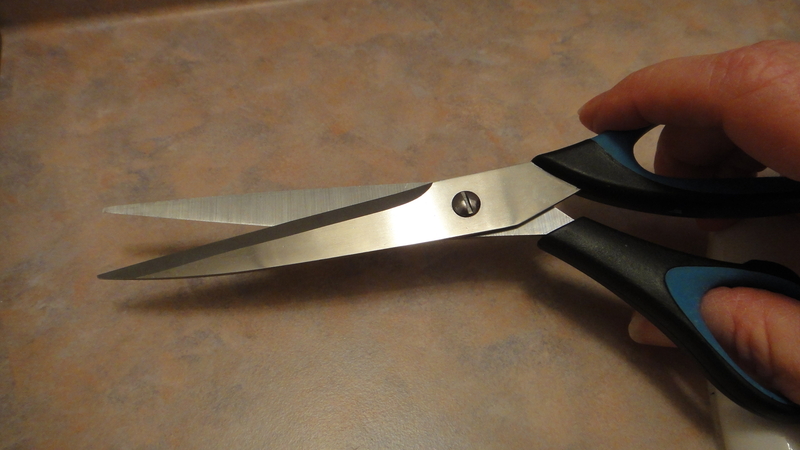 Use your hand to operate the scissors, then cut quickly and sharply, leaving 1.6” at the top. Use a ruler if necessary. Both toothpaste tubes and defective nouns require squeezing. Weird, isn't it? At this point, you should look inside and marvel at the amount of toothpaste that you almost threw away! 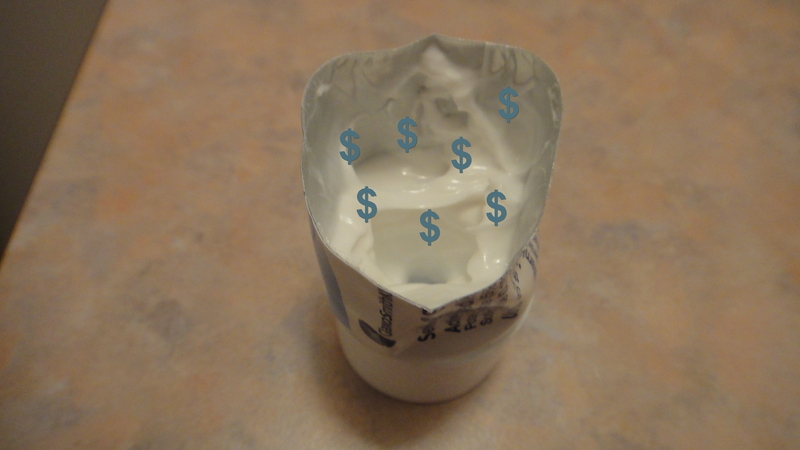 Some people see little dollar signs the first time they look inside a cut tube. If this happens to you, don’t be alarmed, just don’t tell anyone else. Yes, that much was inside that tube! Some people say they see dollar signs in this. I don't,but some do. 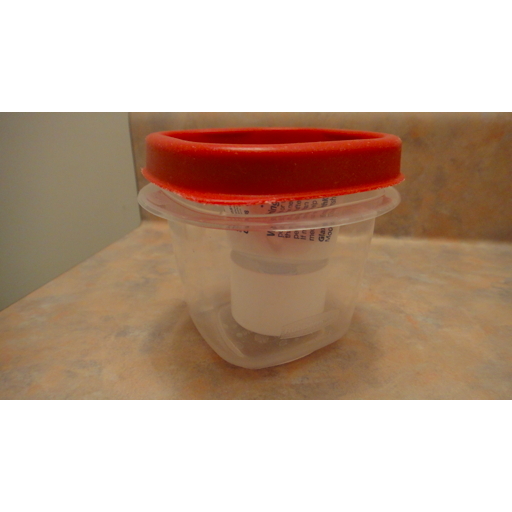 To prevent the exposed toothpaste from drying out, you need to place the tube in a container. It's almost like a piggy bank. If you are not squeamish and don’t share your toothpaste with anyone else, you can just dip your dry toothbrush in the opening to use up the toothpaste. If you share the tube, be sure not to tell the other person you are doing this. Tell them you are using the next method. 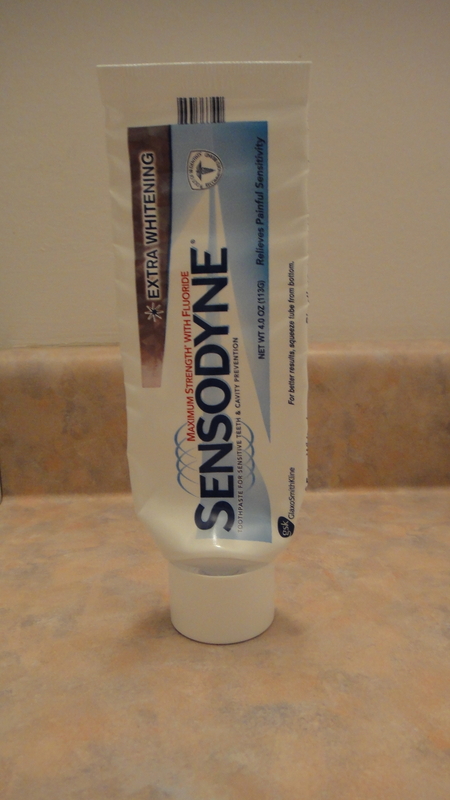 Dip into tube for toothpaste. 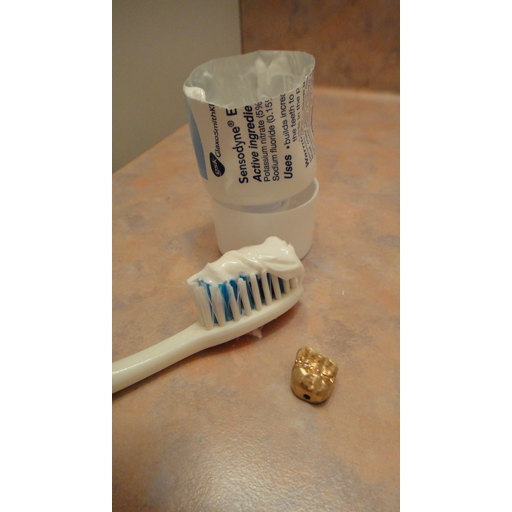 Don' t forget to brush any gold crowns you have lying around that were once on your mother's charm bracelet. If you are squeamish or the person you share the tube with is in the bathroom at the same time, go ahead and use a Q-tip. Dip it in the toothpaste and wipe it on your brush. Then place the Q-tip in a plastic bag. You can use the other end tomorrow. Do not throw the Q-tip away even after the two uses! Q-tip method for the squeamish or if you share the toothpaste with someone else and they are watching you. 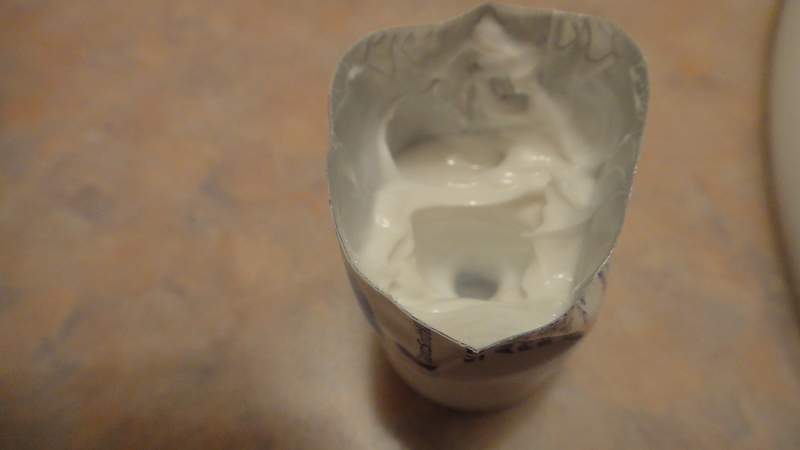 Once the tube is empty (check the little opening that the toothpaste comes out of! ), you can throw it away. I’ve heard reports of people licking the inside and then licking their toothbrush, but who in the world would do a thing like that? Now you are left with the Q-tips and the plastic bag. 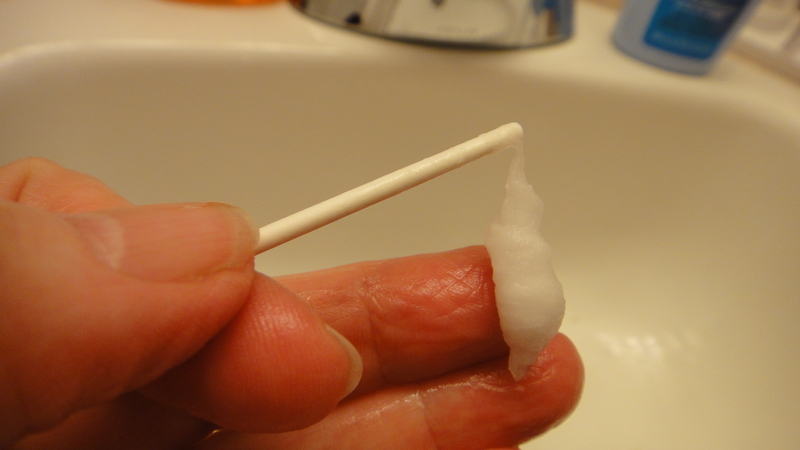 Depending on the amount of toothpaste on each Q-tip, you can probably polish at least your large front teeth. Then turn the plastic bag inside out and polish your lower teeth. If necessary, open another tube of toothpaste and squeeze a little on your toothbrush to finish the job. 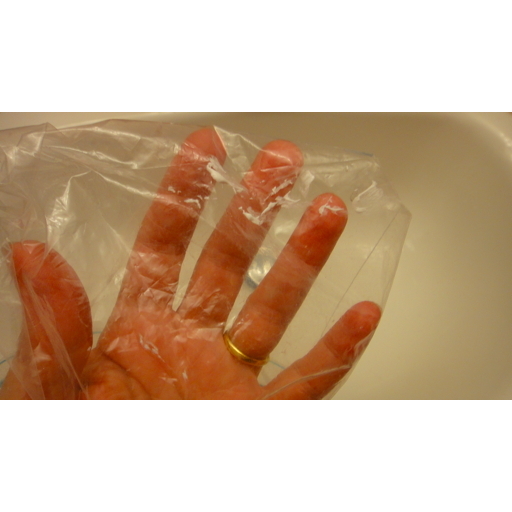 If you are squeamish, you will have more toothpaste on the plastic bag. I lost my squeams a long time ago and prefer dipping. For those who are serious about wealth building, you can run the Q-tips under water to remove the cotton. Finding new cotton to wrap around the tip shouldn’t be too hard. A lot of free cotton comes in medicine jars. Dryer lint is also a possibility. I can’t help you with how to attach the cotton or lint. If you are really planning to do that, you need a special kind of help. Make an appointment today. Warm water removes the used cotton. After that, you're on your own. Even I can't help you. Now, do the math. Do you see what I mean about saving lots of money? And toothpaste is only the beginning. 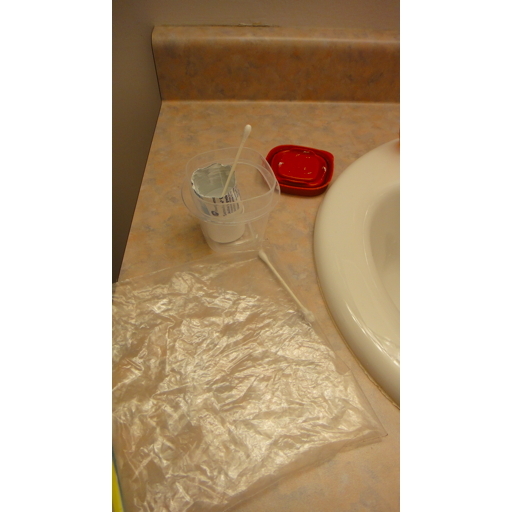 You can do this with other things that come in tubes: lotions, hemorrhoid cream, and glue. Don’t forget to label the tubes carefully. I’ve heard reports that hemorrhoid cream used on the teeth reduces swelling in gums, but it causes food to slide down your throat before your can chew properly. If this has been helpful, and I know it has, please take a moment to consider all of the good advice you have received from this blog. As you know, it takes a lot of chocolate to run a blog that is full of so much, shall we say, helpful information. I rely on the generous gifts of dark chocolate from family, friends, and perfect strangers to keep going. Send your chocolate today. Thank you. In the interest of fairness and the limitations expressly stated on yearstricken’s poetic license, you must be at least ten years old or younger, be responsible for buying your own toothpaste, brush your teeth at least three times a day, and use a lot of toothpaste in order to potentially move into the realm of what yearstricken claims is “lots of money.” Most users of this method can expect to save dozens of dollars over the course of their few remaining years and teeth. By using your fantastic method, I’ll be showing my shiny teeth as I laugh all the way to the bank with my savings of dozens of dollars!!! Thank you, Year-struck! I am here to help you, lexiemom. I have even more wealth-building ideas. Love it. I am one who squeezes the very last out of the tube, and have found many effective ways to do so. But not this one! Thanks! I am hiding this post from Mr. Worrywart! p.s. Where should we send the chocolate? Mr. Worrywart must be a man after my own heart. Leave the chocolates at the front desk of the Heartbreak Hotel. They know me there. You are my kind of economizer. I cut tubes of shampoo and lotion. Now I’m moving on to toothpaste. Thanks for your excellent advice. When I’ve saved enough on tooth paste, I’m sending you some really expensive chocolate. Excellent advise. 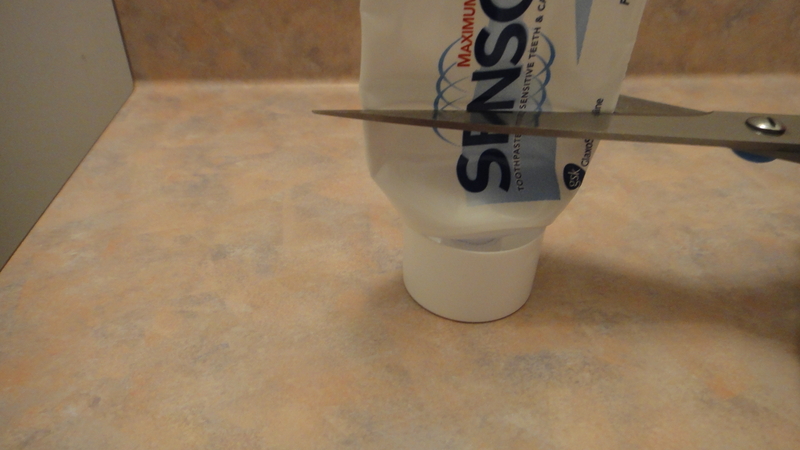 I’d been cutting the toothpaste tube for years…until they took my scissors away. That’s why I hide my scissors. Now that you’ve compressed my learning curve, I don’t want to string you along, but my cutting edge research on dental floss may well have me sending champagne from my pool side cabanna to yours. SMILE. I look forward to the champagne. Since you are into dental floss, I shall have to send you something to commemorate your research. What kind of plaque would you like? I’ve always done this :D! It is crazy how people don’t do things like this. I do hate to be wasteful! You are a girl after my own heart. Did I mention that I was thinking about adopting you? I also have the kitchen scissors that break in two. Now you know what they are called a defective noun. You said something like adopting me as a granddaughter before, to which I retorted that you aren’t old enough to be a grandparent! I’m so glad you used the word clever rather than cheap. Thank you. Ruth, we must be friends. I like how you think. Could you let me know how to get the rest of the peanut butter, or jam, or mayo out of the jars with the shoulders on them, around the curves at the top where the straight knife can’t go? Thx, no rush. I have heard of people who use their fingers. Can you believe it? Margie, did I mention that I am highly allergic to facts and logic? I found your blog by linking from Worrywart’s favorites, and just in the nick of time, I’d say! My medicine chest is currently riddled with no fewer than four “empty” tubes of toothpaste, and no amount of gentle cajoling or horse-whipping will convince my children to use the remaining dollops. If you would be so inclined, I would like to propose an adaptation of your wealth-building tutorial aimed at youngsters. However, since they have absolutely no regard for the value of a dollar, the Youth Seminar will need to be focused on a different motivational factor, such as the avoidance of horse whippings. Not that your suggestion doesn’t have it merits – I think I’ll pass. While I do squeeze the crap out of the dang thing, and roll it up with a butterfly clip to keep it from leaking back down, I think I’ll stop short of cutting it open and viewing its guts. Some things should remain hidden. Tricia, I have heard from other sane people that they are able to throw the toothpaste tubes away. I’ve always wondered what that was like. What a great gift! I plan to get one and write a blog post with it sometime. Thank you. I wish you’d invent a regulator for the cap of the tube…much like the cap a bar tender puts on a bottle of whiskey so only an ounce at a time comes out. I can not convince my husband that he only needs a pea size dab of toothpaste. He’s a product of those glitzy ads that show an s-curved log of paste on a brush. Alas we’ll never acquire the wealth you paint for us. I try to compensate, by simply saying we’re out of toothpaste and letting him do without. See you at the bank. I’ve even known of a person who would go so far as to use their Defective Noun to cut the flat length of the toothpaste tube open and scrape the toothpaste residue from there into the chopped-off cap end for the prescribed rescue operation. 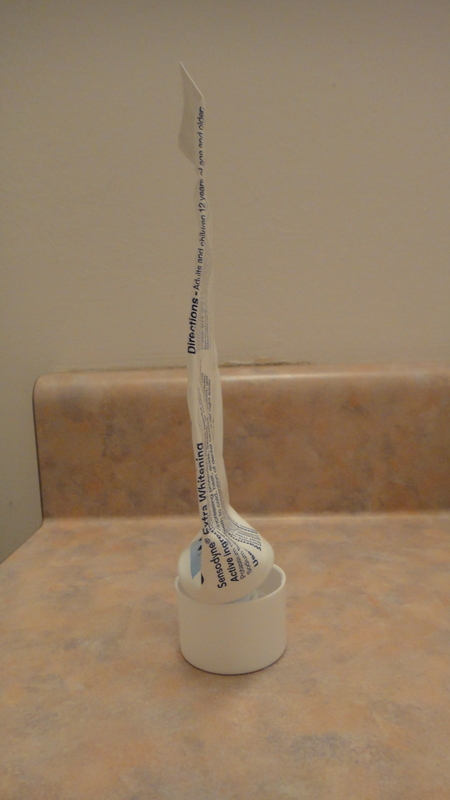 The most important thing to remember when using the open-tube-plus-applicator method on the hemorrhoid cream tube is *not* to use the toothbrush in that instance. I have heard the same thing, Kathryn, but really what kind of women bloggers would do things like that with a defective noun? Thank you for the hint. I see I need to brush up on hemorrhoid cream usage. This is pure genius. I don’t know how me and my cheapness didn’t think of it first. I’m ashamed. After I wipe the tears from my eyes, I am going to go dig in the trash for that “empty” tube I threw away this morning. I can see my bank account swelling already! You are a life saver! Now I can afford that cruise I never wanted to take! I see dozens of dollars in your future! We grew up doing this. I’m always so shocked when people toss it. I’m like, “But you haven’t cut it open yet!” ha! Thanks for sharing this! So many people DON’T know it! We must spread the word!